Arran Strawson first appeared for the Dynamos in 2012/13 and 10 goals and 24 assists during his debut campaign saw him quickly make a name for himself in Gillingham – his committed displays scooping him the Coach’s Player of the Year Award come the end of the season. He was then the first returnee to be announced in the summer months as Head Coach Kevin Parrish moved quickly to secure his services again – the blue liner putting in another formidable display as he managed 9 goals whilst playing a hand in 39 more for a total of 48 points in 50 outings. 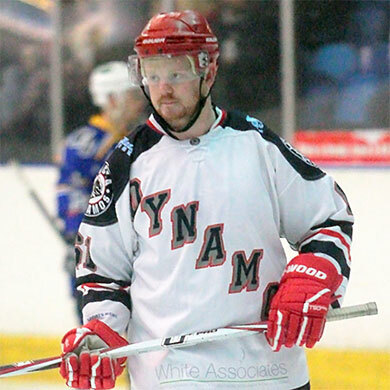 His 39 assists was the most achieved by any defenceman in a Dynamos jersey over the course of the campaign and he finished the season having taken his total appearances for the club to 101 whilst managing 82 points in the process. Now the blue liner, who can also play as a forward if required, will be looking to add to that impressive tally having penned a contract for a third consecutive term that will see him line up with the Mos in Gillingham again from September. “Arran is a great player to have on the ice and a great player to have in the changing room so there was never any doubt that I would want him back for 2014/15 and I’m delighted he was just as keen to stay. He’s the type of player that leaves nothing in the tank and is willing to do everything for the badge on the front of his jersey and, as a coach, there’s no more you could ask. He is a safe pair of hands at the back with excellent experience at this level having now spent three seasons in the NIHL South Division 1. On top of that he has a knack for scoring important goals – like his game winner against Solent & Gosport back in October with just 3 seconds remaining on the clock – whilst he also has the bravery and determination to drop the gloves when needed as his bout with Jamie McIlroy in the cup semi-final with Streatham demonstrates. He’s an excellent competitor, is very popular with the supporters and I look forward to working with him again when the new campaign gets underway”.